Imagine trying to live on the surface of a world that alternately freezes and bakes as it orbits the Sun. That's what it would be like to live on planet Mercury—the smallest of the rocky terrestrial planets in the solar system. 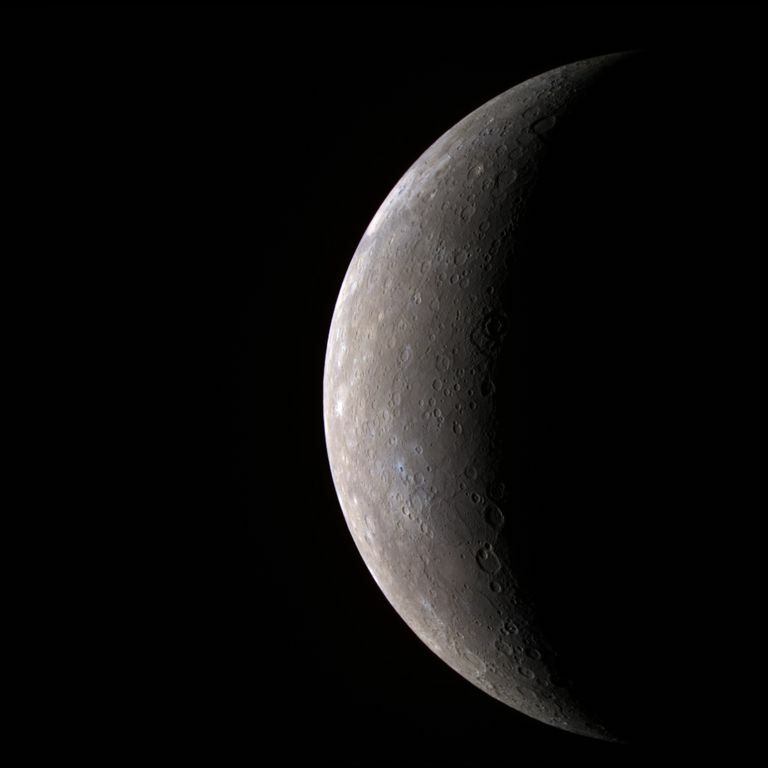 Mercury is also the closest to the Sun and the most heavily cratered of the inner solar system worlds. Even though it's so close to the Sun, observers on Earth have several chances per year to spot Mercury. These happen at times when the planet is at its farthest in its orbit from the Sun. Generally, stargazers should look for it just after sunset (when it is at what is called "greatest eastern elongation", or just before sunrise when it is at "greatest western elongation." Any desktop planetarium or stargazing app can supply the best observing times for Mercury. It will appear like a small bright dot in the eastern or western sky and people should always avoid looking for it when the Sun is up. Mercury's orbit takes it around the Sun once every 88 days at an average distance of 57.9 million kilometers. At its closest, it can be only 46 million kilometers away from the Sun. The most distant it can be is 70 million kilometers. Mercury's orbit and proximity to our star give it the hottest and coldest surface temperatures in the inner solar system. It also experiences the shortest 'year' in the entire solar system. This little planet spins on its axis very slowly; it takes 58.7 Earth days to turn once. It rotates three times on its axis for every two trips it makes around the Sun. One odd effect of this "spin-orbit" lock is that a solar day on Mercury lasts 176 Earth days. Mercury is an extreme planet when it comes to surface temperatures due to the combination of its short year and slow axial spin. Additionally, its proximity to the Sun allows parts of the surface to become very hot while other parts freeze in the dark. On a given day, temperatures can be as low as 90K and get as hot as 700 K. Only Venus gets hotter on its cloud-smothered surface. The frigid temperatures at Mercury's poles, which never see any sunlight, allow ice deposited by comets into permanently shadowed craters, to exist there. The rest of the surface is dry. Mercury is the smallest of all the planets except dwarf planet Pluto. At 15,328 kilometers around its equator, Mercury is even smaller than Jupiter's moon Ganymede and Saturn's largest moon Titan. Its mass (the total amount of material it contains) is about 0.055 Earths. Roughly 70 percent of its mass is metallic (meaning iron and other metals) and only about 30 percent silicates, which are rocks made mostly of silicon. Mercury's core is about 55 percent of its total volume. At its very center is a region of liquid iron that sloshes around as the planet spins. That action generates a magnetic field, which is about one percent of the strength of Earth's magnetic field. Mercury has little to no atmosphere. It's too small and too hot to keep any air, although it does have what is called an exosphere, a tenuous collection of calcium, hydrogen, helium, oxygen, sodium, and potassium atoms that seem to come and go as the solar wind blows across the planet. Some parts of its exosphere may also come from the surface as radioactive elements deep inside the planet decay and release helium and other elements. Mercury's dark grey surface is coated with a carbon dust layer left behind by billions of years of impacts. While most worlds of the solar system show evidence of impacts, Mercury is one of the most heavily cratered worlds. Images of its surface, provided by the Mariner 10 and MESSENGER spacecraft, show just how much bombardment Mercury has experienced. Its covered with craters of all sizes, indicating impacts from both large and small space debris. Its volcanic plains were created in the distant past when lava poured out from beneath the surface. There also some curious-looking cracks and wrinkle ridges; these formed when the young molten Mercury began to cool. As it did, the outer layers shrank and that action created the cracks and ridges seen today. Mercury is extremely difficult to study from Earth because it is so close to the Sun through much of its orbit. Ground-based telescopes show its phases, but very little else. The best way to find out what Mercury is like is to send spacecraft. That spacecraft orbited Mercury from 2011 until 2015, when it was crashed into the surface. MESSENGER's data and images helped scientists understand the structure of the planet, and revealed the existence of ice in permanently shadowed craters at Mercury's poles. Planetary scientists use data from the Mariner and MESSENGER spacecraft missions to understand Mercury's current conditions and its evolutionary past. There are no missions to Mercury scheduled until at least 2025 when the BepiColumbo spacecraft will arrive for a long-term study of the planet. Mercury's day (the length of time it takes to orbit the Sun) is 88 Earth days. Temperatures range from well below zero on the surface to nearly 800F on the sunlit side of the planet. There are deposits of ice at the poles of Mercury, in places where sunlight is never seen. The MESSENGER spacecraft provided detailed maps and images of Mercury's surface. “Mercury.” NASA, NASA, 11 Feb. 2019, solarsystem.nasa.gov/planets/mercury/overview/. “Mercury Facts.” Nine Planets, nineplanets.org/mercury.html. Talbert, Tricia. “MESSENGER.” NASA, NASA, 14 Apr. 2015, www.nasa.gov/mission_pages/messenger/main/index.html.